I might have watched the 1961 movie adaptation of the 1957 Broadway musical West Side Story a few too many times as a dreamy teenager. So much so that I know every word, every note, every iconic dance step by heart. 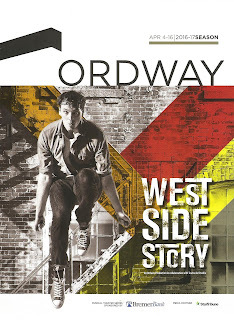 I'm happy to report that the Ordway's new production doesn't disappoint this West Side Story mega-fan. In fact, It's positively thrilling to see this musical I love so much live on stage with some of my favorite local talent. The cast (which also includes some national talent) is phenomenal, Leonard Bernstein's stunning score sounds beautiful as played by the nearly 20-piece orchestra directed by Raymond Berg, and the dancing, oh the dancing! Jerome Robins' iconic and ground-breaking choreography is easily identifiable here, and this cast just nails it (choreography by Diane Laurenson, who has frequently paired with director Bob Richards on WSS). 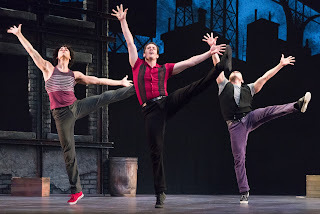 This West Side Story is so gorgeous, I wish I could see it every night of its two-week run! This 1950s adaptation of Shakespeare's classic tale of star-crossed love, Romeo and Juliet, is unfortunately always timely with its themes of racism, fear of immigrants, gang violence, underprivileged youth, and police bias against people of color. But in this story, it's the love between two people on opposing sides that eventually begins the healing, although only after tragedy. In a world with so much violence and turmoil, one wishes that all our problems could be solved through love and dancing. West Side Story is very much a dance musical; the dancing is not just fun to watch, but also tells a story and defines who these people are. The opening dance sequence tells you what you need to know about the Jets and the Sharks and the streets of NYC before a word is spoken. Tensions continue to rise at the school dance, where both sides work out their aggression through dancing as they attempt to one-up the other side. 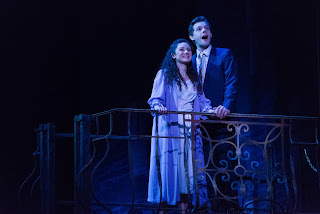 The requisite dream ballet (it is a 1950s musical, after all) beautifully expresses Maria and Tony's wish for a world of peace in which they can be free to be together, in a way that mere words, or even words put to music, could not. I've heard it said that if emotions are too great for words, they can be expressed through singing, and if they're too great even for singing, they can be expressed through dancing. 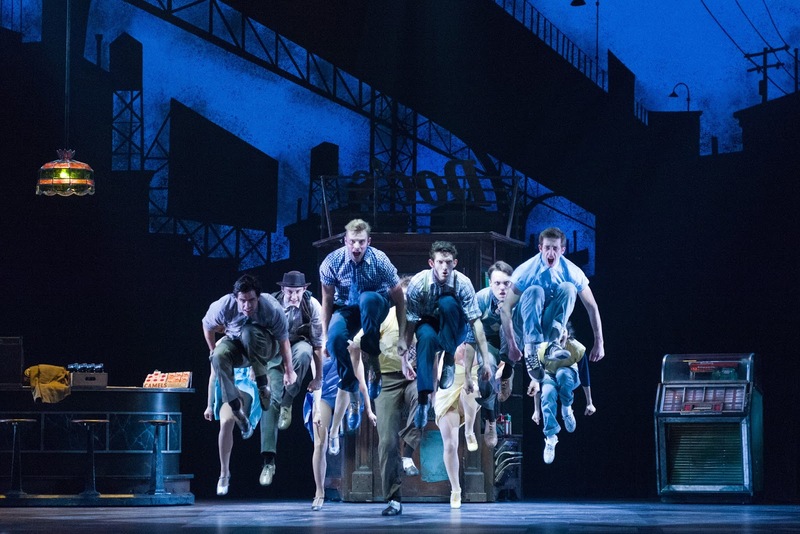 That's West Side Story; heightened emotions of love, hate, rage, fear, grief, and hope expressed through dance, choreographed and performed to perfection. While only one of six leads is local, about three-quarters of the ensemble is local, which is great to see. But who's counting, they're all so wonderful and every person in the ensemble has a job to do and a story to tell, and they do. The one local lead is, of course, Tyler Michaels, who is so wonderful as Tony. His voice sounds beautiful on all of these almost operatic songs, and his vocal control in songs like "Maria" is impeccable. He has great chemistry both with Riff and the Jets, and his Maria, the lovely Evy Ortiz. She sings like a dream and also brings such life and heart to the character. In the school dance scene I couldn't take my eyes off of Riff and Graziella, and that's thanks to the well-matched Tyler John Logan and Larissa Gritti, with their irresistible chemistry and incredible dance skills. This Tyler is so fantastic as Riff that his absence is palpably felt in the second act (spoiler alert). Other highlights in this terrific ensemble are Desiree Davar, who brings much spirit and depth of emotion to Anita; Rush Benson as Action, with all the barely controlled passion neccessary for the character; Mark Rosenwinkel, who perfectly delivers as Doc, the heart and soul of the story; and a scary good James Michael Detmar as Lt. Shrank. The design of the show feels authentically 1950s NYC. Andrea M. Gross' period costumes clearly define the Jets in shades of blue and Sharks in shades of red, with pretty and peaceful pastels in the dream ballet. James Youmans' versatile set includes several fire escape pieces, the facade of Doc's store used for both inside and out, and backdrops of a bridge or the school gym or under the highway. Karin Olson's lighting design sets the tone of the scene, from the bright and peaceful dream sequence, to the harsh lights of approaching cops. Finally, I wish all scene changes could be dancing scene changes - just do a pirouette as you move that piece of furniture please. The Ordway has been on a roll with their local productions the last few years (e.g., the "boisterous and gorgeously sung" The Pirates of Penzance, the "singular sensation" A Chorus Line, and the "scrumptious" White Christmas, so nice I saw it twice), and West Side Story is another hit, proving once again that you can do big-scale Broadway-sized musicals with (mostly) local talent onstage and behind the scenes. I only wish they'd do longer runs (so I could go back and see it again!). West Side Story continues through April 16 only, so get there fast to see this thrilling production of a musical theater classic.